Hi there, how are you doing? I hope you have had a really good couple of weeks. Mine have been pretty busy and lots of fun. I must confess I always enjoy my night’s out at the theatre. I will pretty much go along and watch anything. As I just love the experience of seeing a live performance. And the food and drink that normally accompany an evening of this kind. I may have accidentally broken my own show’s to week’s ratio this last fortnight. As I have been to to see three West End productions, since I spoke to you last. The first of these was the musical The Girl From The North Country. Which was written by Conor McPherson and features the songs of the legendary American Bob Dylan. 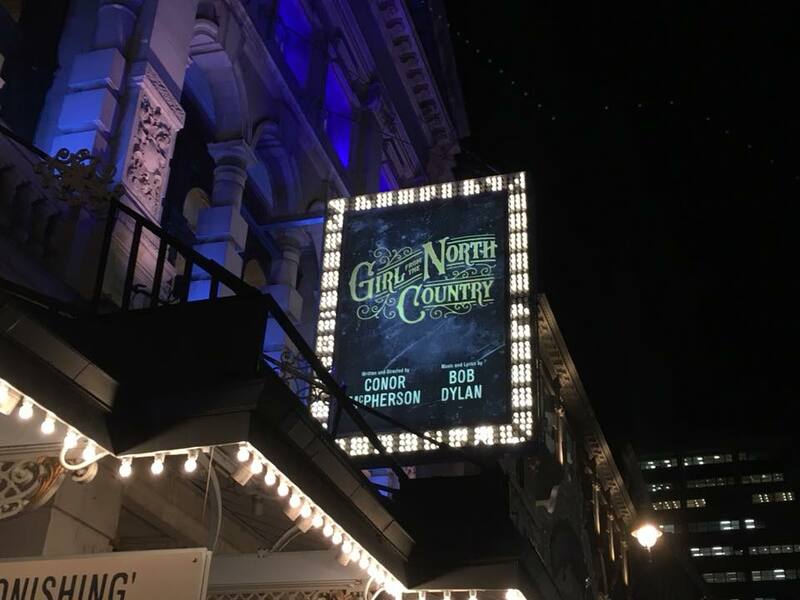 It originally had a successful run at The Old Vic before moving to the Noel Coward Theatre in the West End. Which is where I saw it last week. I purposely did not research anything about it in advance. As I like to be surprised. Although I did know it featured the lyrics of the Nobel Prize winning singer. I had however heard nothing but great things about it. For the people who may have an interest in this sort of thing. I can confirm that the house Rioja served at the theatre was very nice, which is not always the case in theatre land. The quality can range a lot but the price rarely does, so a success here I believe should be celebrated. The show itself was brilliant. It is set at a Guest House in Minnesota in 1934. It focuses on a struggling family and a multitude of guests and some local residents, who visit the place. It very cleverly tackles a lot of different issues and situations. Which were prevalent at the time and to be honest a lot of them in many ways, still are today. It is a very clever story line. Which asks a lot of questions, making you think about the characters, their circumstances and futures. These are then all tidied up and then revealed pretty much right at the end of the play. The whole cast are exceptional with some very powerful performances on display. Also the beauty and skill with which the songs are performed is breathtaking. While very much keeping to the feel and time of the story. There will be some Bob Dylan songs you know well and recognise. Then some you do not, but all of them are sung perfectly. I really enjoyed it. It is a very slick and well put together show with a great deal of comedy moments. Which baring in mind that a lot of the subjects in the story are very dark is clever and works well. As humour in my opinion at least, is an important part of everyday life even during the bad times. Having seen it, I can see why this show has had a lot of five star reviews. If you get the chance I would go and see it while you can. Recently it occurred to me, that although I was aware of the man. I had never been to an Oscar Wilde play. I noticed that there was an Oscar Wilde Season on in London, so I thought that would be a good excuse to put that right. 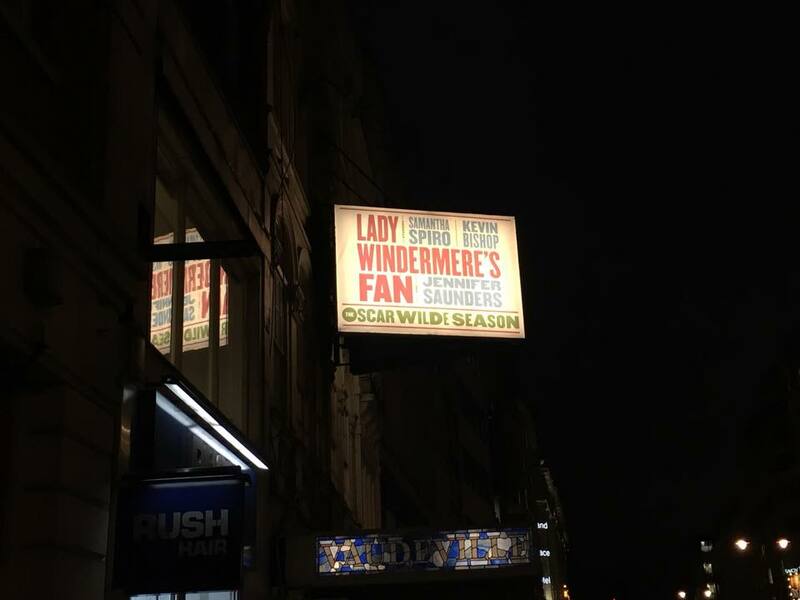 I went and watched Lady Windermere’s Fan at the Vaudeville Theatre on The Strand. It was directed by the brilliant Kathy Burke. It starred Jennifer Saunders, Kevin Bishop and Samantha Spiro. The cast also included none other than the excellent Joseph Marcell. Who played the Butler, Geoffrey in The Fresh Prince of Bell Air with Will Smith. I had no idea he was going to be in it. Me and my mate I was with both worked out who it was during the first half. Then excitedly confirmed this news with each other at the interval. The play was excellent. It was not a story I was familiar with. But I was pretty impressed with how quickly I worked out the main plot details of who was hiding what secrets from whom. It did contain a few of the well known Wilde phrases or sayings. That I was already aware of. Including the sublime “I can resist everything except temptation. The story is clever and well constructed with lots of comedy and jokes thrown in to the mix. As well as some real drama and tension. The cast were excellent and played it all perfectly. The staging and the costumes were pretty spectacular to. Jennifer Saunders was sensational and gave a comedy masterclass during her scenes. You cannot buy class, in her case you just have it. She comes on to do a skit song. While they are changing the scenery. And pretty much steals the show with it. Brilliantly entertaining. 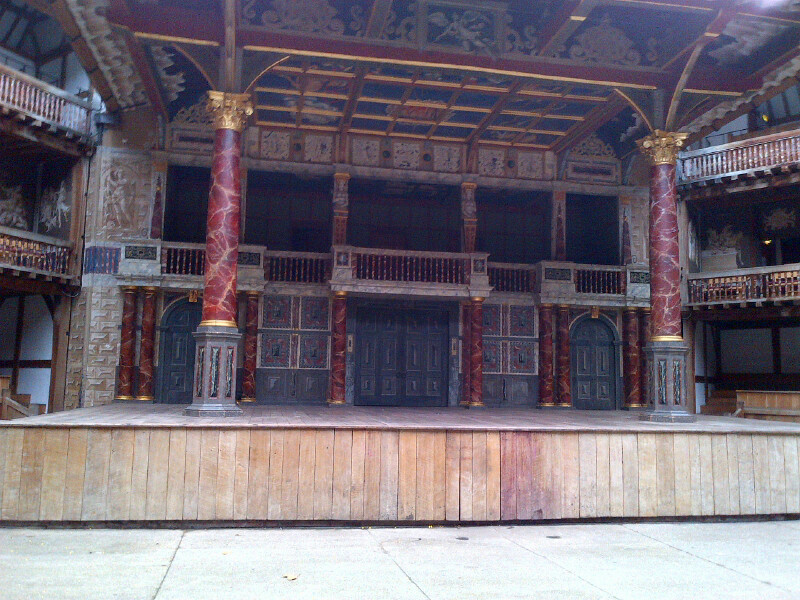 Now having seen this performance much like when I saw my first Shakespeare play last year. I would be more than happy to see more of Oscar Wilde’s work. I might even see what the next play they are doing there in the series is and go along and see that. If you would like a red wine report. It was a limited selection, perfectly drinkable but not as nice as or up to the standard of that served at The Noel Coward Theatre. The cast received a well deserved encore at the end. And the audience left with a nice warm buzz. Just as you should after a top quality West End Show. The theatre fun continued last Thursday evening, When I went and saw the long running musical Wicked. Lots of people including my sister had been telling me how good this show was for years. I have to say they were all right. 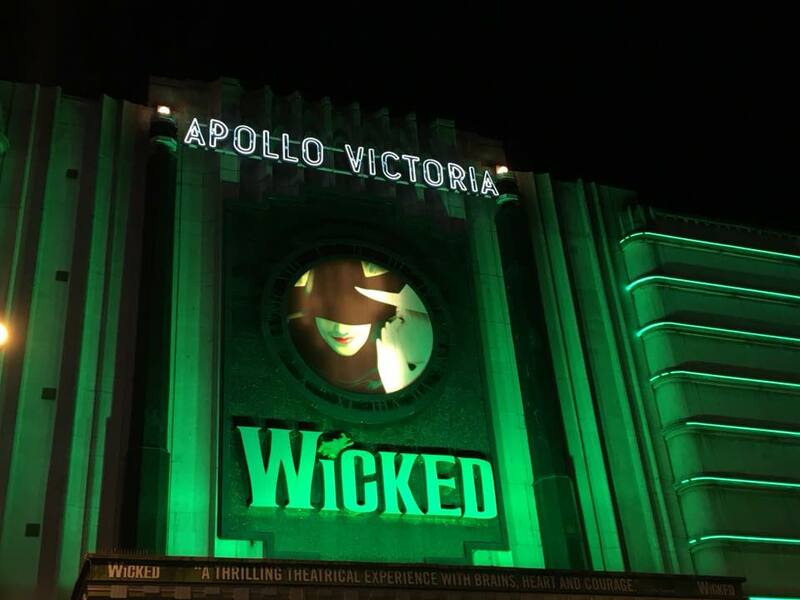 It is currently on at the Apollo Victoria Theatre. Which funnily enough is in Victoria, right next to the underground station. I did have a rough idea what to expect. As people had already given me a few clues as towards the plot. And the fact that it is kind of the story of how Oz from The Wizard of Oz came to be how it was. While supplying the back story of some of the characters. We meet in that classic film. It is a big spectacular production with brilliant sets, scenery and costumes. It is performed by a large cast, so there is often lots of things going on up on the stage and makes for some excellent and lively group dance routines. The two lead actors Alice Fearns who played Elphaba and Sophie Evans who played Glinda were fantastic. Their vocal performances were out of this world. The Story is very clever and messes with the how situations we are in shape us and opinions of others categorise us. Which is still very much a big part of the world now, as it was when this production was first released. It really does put a very different slant on how you view Oz and the people that we met there. There are also some very clever nods to the original story and it is all linked up and tied together very nicely. As with most of these sorts of shows it is uplifting with some nice moral messages. But most importantly is very entertaining, with a mixture of drama, happiness, sadness and laughter, like of course life itself. It is a fabulous show and well worth seeing. Just do not leave it as long as I did to get round to doing so. To continue the refreshment theme. The red wine at this theatre came with limited choices but the Merlot was perfectly drinkable and did the job. 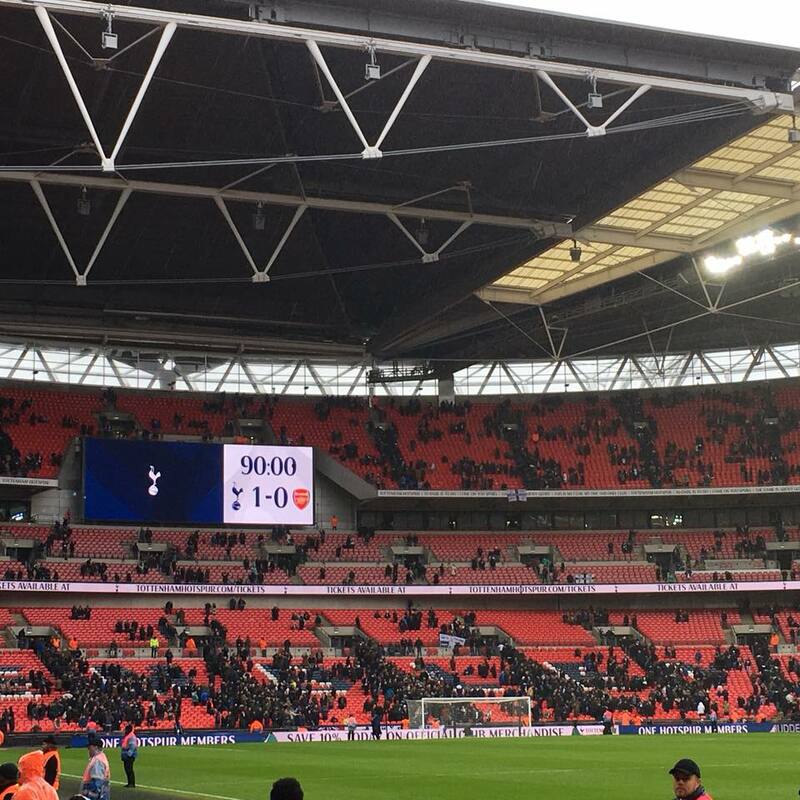 I had a brilliant time at Wembley Stadium last Saturday afternoon watching Tottenham Hotspur beat Arsenal in the Premier League. It is always the biggest league fixture of every season. This was the first one that I had ever been able to get to in person, so even before the game I was massively excited. But also terrified, as I did not want to lose. It was a great performance from my team. We looked in control for most of the match and should have scored more goals. That nearly cost us right at the end. When they had two great chances. Thankfully they missed them both. The atmosphere inside the ground was sensational. 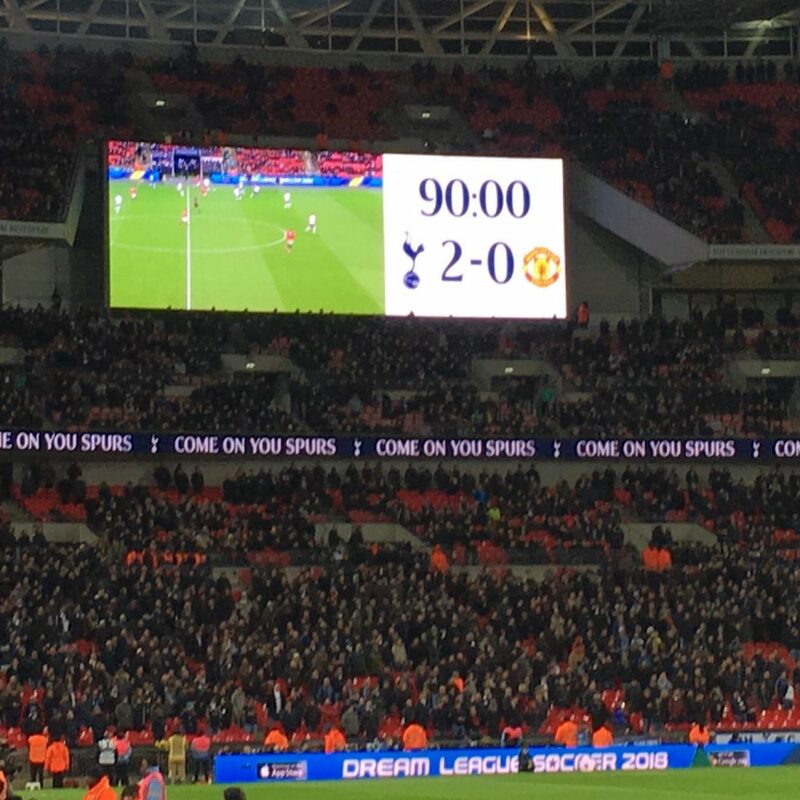 It was a great moment celebrating the goal and the win with all my fellow Spurs fans. I now have an one hundred percent record of seeing us win this derby. So I think the club should personally invite me to see this fixture next season in case I am a lucky omen. I have finally finished reading David Jason’s latest book Only Fools and Stories. It was brilliant. Funny, entertaining and hugely interesting. He should definitely do one of those one man show things. I would certainly go and watch him sit on stage and talk about his career and tell all the funny stories.It is great to see him back on television in Still Open All Hours. He is as brilliant as ever in that. I have started a new podcast this year. Which is a combination of stories from my past, observations from the present and a selection of some of the interviews I have done with various people over the years. Just follow the link to the latest episode. And if you like what you hear you can catch up on the previous ones and subscribe to I-tunes, so you get them delivered straight to your device when the latest one is released. It is always interesting and fun at work. Recently I met former Radio One and current Five Live Presenter Nihal. It is always good meeting a fellow Spurs fan. Although he did make me really jealous. As that afternoon he was off to meet and interview Mauricio Pochettino the Tottenham manager. I was so close to asking him, if may be I could tag along. But I had things to do already. I was also in the work canteen a few Sunday’s ago when the leader of the Labour Party Jeremy Corbyn walked past me. You really never know who you might bump in to walking around or in the lifts. Which certainly does make the workday more interesting some days. 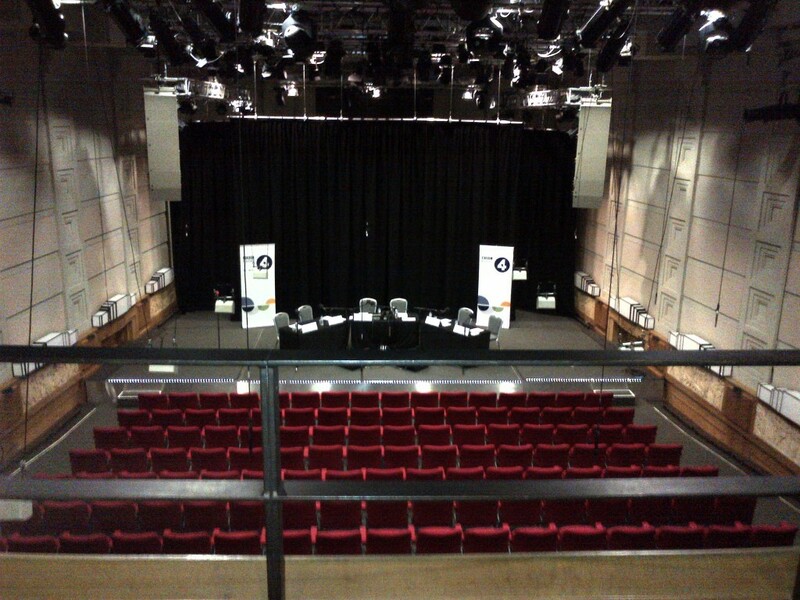 I am looking forward to heading to the BBC Radio Theatre tomorrow to see some live comedy. It is the second series of a programme that I saw being filmed last year. It is simply called Live at the BBC. It features new and break-though comedians. Giving them chance to appear on television. 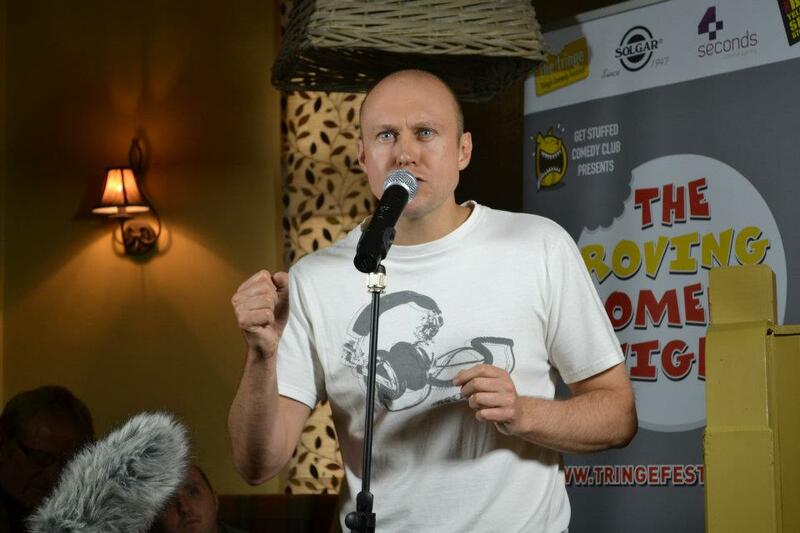 Then normally a slightly more well known comic will headline the show. The recording I watched last year featured Felicity Ward, Spencer Jones and James Acaster. I am hoping for a similarly brilliant line up this time. I am sure it will be a good laugh. Which for a comedy programme is let us face it essential. Hi there, how are you doing? I hope you have had a really good couple of weeks. Mine have been nice and busy with loads of fun things going on. I once again managed to do something I had not done before. 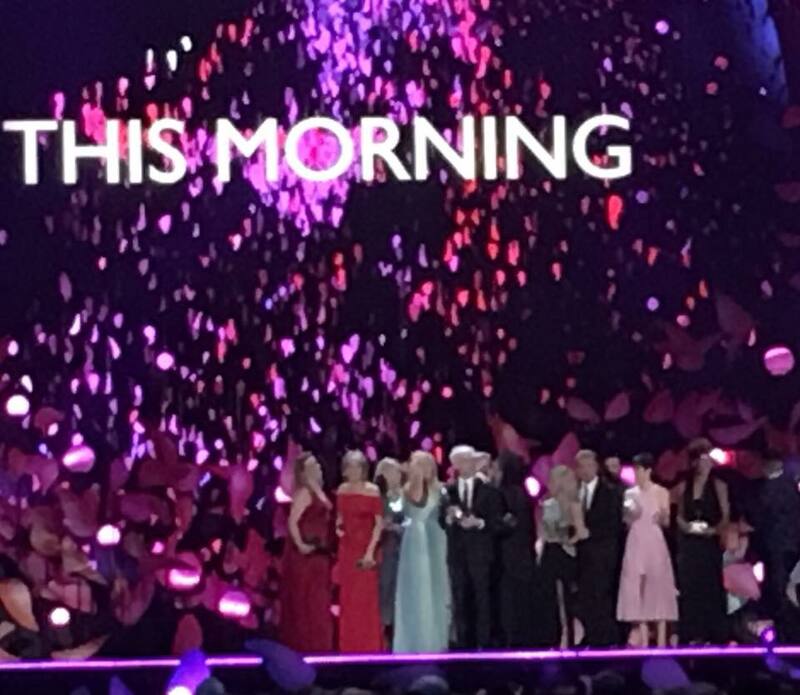 I went along to this year’s National Television Awards at the O2 Arena. It is something that I have watched on television from home for many years. It was great to actually get the opportunity to be sitting there in person to watch it all unfold. The place was looking very glittery and sparkly. When I arrived it was getting fairly close to show time. I just had chance to grab a quick drink before I had to take my seat ready for the ceremony. There was definitely a buzz and an air of excitement in the place. 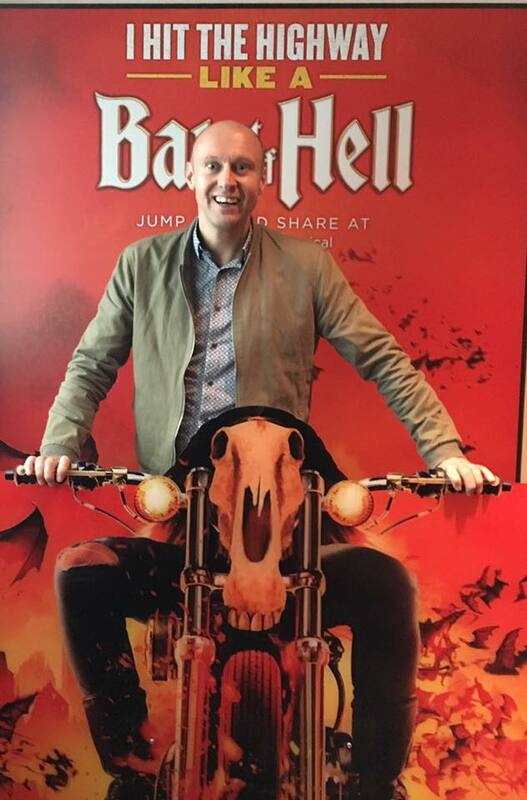 With around five minutes to go before we went live to the nation our Arena MC the brilliant Andy Collins came on to get the audience hyped and ready for action. And also to tell us what was going to happen right at the start of the programme. While he is doing this all the celebrities are filtering in to their seats, so that they are all sat down ready for when the proceedings begin. The opening sequence was pre-recorded, so the first thing we actually witness live is the pay off to the opening gag. Which is Piers Morgan being lowered from the roof. Before Dermot O’Leary re-appears to save the day and remove the Good Morning Britain presenter from view. Then we get live music from last year’s X Factor winners Rak Su. Once their song is over and after Dermot’s opening monologue. It is down to business. The night follows a pretty standard pattern. The people presenting the awards come on, give us the nominations. Then they announce the winners. And they come up to give their speech. In the arena like the people at home, we see the clips and the faces of all the nominees in turn on the big screens. 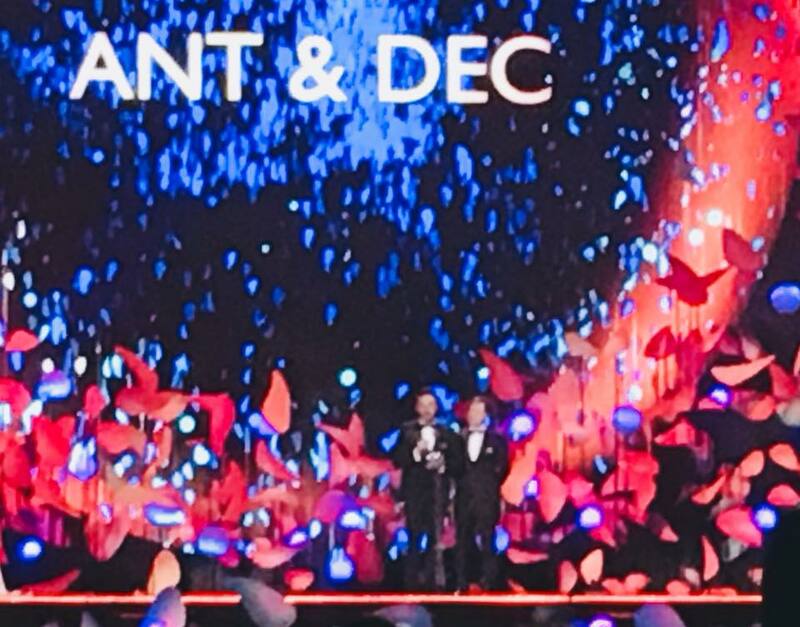 It was nice to see Ant & Dec pick up another three awards. I was also pleased to see This Morning get one as well to. I have seen the Geordie duo, Phillip Schofield and Holly Willoughby present various different studio based shows. They are all brilliant and at the top of their profession. It is one of those disciplines that looks a lot easier than it is. Especially when the aforementioned foursome are the ones doing it. It was a really good night and fantastic to see so many talented performers and writers all in the same giant room. It just reminded me of the high standard of television from all the different genres. That we have access to on our screens. Everyone was actually very well behaved. And the night went pretty smoothly. I thought Dermot did a great job of hosting it. In the main the guests reading out the nominees did what they had to do. Plus most of the thank you speeches were short and to the point. Which is what you want. I thought it was nice to see Toff coming up for the I’m A Celebrity Award and doing a bit of back stage presenting. I do like her, she is upbeat, happy and positive. Plus I can tell she is keen to learn more about the trade of presenting. She did a great job handling Stanley Johnson, when they presented an award together. It was nice to see Andy Collins on stage doing his thing during the ad breaks. While you at home got sold holidays and hoovers. He entertained us. Another one of his jobs seemed also to be wrangling the celebrities, keeping them in order and in their seats ready for when they were going to be in the next segment. I have met him a couple times. He is a top man. As well as being very funny. It was good also to see another familiar face as the Stage Manager for the evening was Alan Conley. Who does pretty much all the big shows. He is on Strictly Come Dancing, Britain’s Got Talent and Ant & Dec’s Saturday Night Take Away to mention but a few. He is a man at the top of his particular game and very well respected within the industry. After the awards were over. I stayed for a couple of drinks before heading home and calling it a night. It was a brilliant experience. I really enjoyed myself. It was a fun event to be at. I got chatting to some younger people just before I left. We were talking about our stand out moments. Most of them said it was Blue Planet 2 getting its award for highlighting the issue of plastic in our oceans. If that is the thing that struck the biggest cord. Despite what some people might think about the youth of today. I do think the future looks like it is in very good hands. As I always turn up for everything very early because I hate being late for anything. I arrived at the O2 before the NTA’s with more than enough time to have a look around the latest Elvis Presley Exhibition they have there. I went to a huge one all about his entire life, that was there a few years ago, which was amazing. This new one is quite a bit smaller and focuses solely on his touring days. 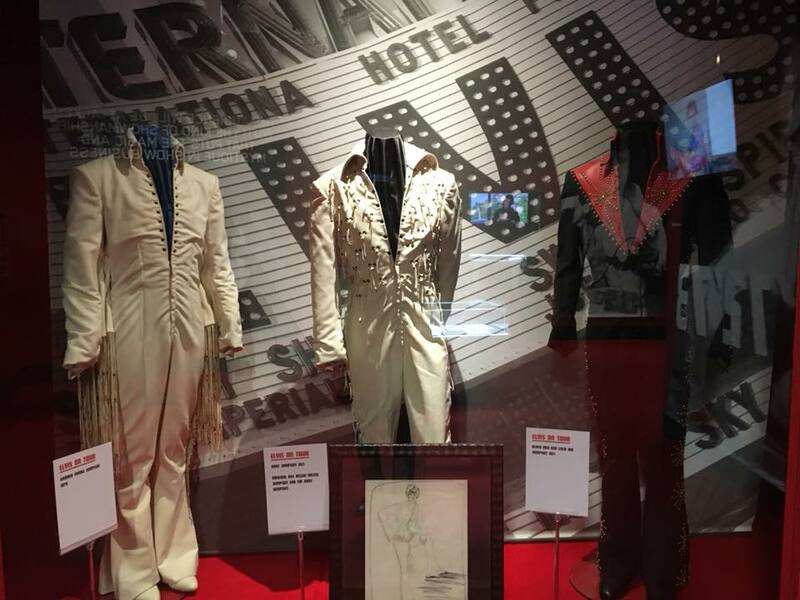 They have lots of his old stage and tour costumes on display, a few precious personal items and lots of footage of him on stage in various locations. They also have a recording of a press conference he did to promote one of his tours. Which is an interesting watch. If you are a fan of the man and have the time, it is worth a quick look round, I think. I certainly enjoyed it. I was lucky enough to be able to go and watch an episode of the new series of Upstart Crow being filmed at the London Studios on the South Bank. It is a show I really like a lot. The subject matter is great. Ben Elton is an amazing writer. I really like how even in his history based comedies. He still manages to get social comment and a bit of politics in to them. He does it brilliantly with this programme, specially with Shakespeare’s always long and awful commutes between London and Stratford Upon Avon. It is also so clever how each episode is basically all about the writing of a different Shakespeare play. That in itself is genius. Not only is the writing brilliant but the cast are all fantastic. It is a star studded line up to say the least, with a lot of comedy experience between them. Everyone is so good in it and play their parts so perfectly. But a special mention does have to go to David Mitchell, who is the only one who has to appear in pretty much every scene. So he by far has the most dialogue to learn. And thanks to the writing of Mr Elton. Some of his speeches are not only long and complicated but often tongue twisting challenges. He has to be one of the best comedy actors, we have at the moment. In fact he is just a very funny man. As he proved during short breaks between some of the scenes. It was the first time I had been to a filming of a classic studio based sitcom with four different sets to move between and the actors playing out the whole scenes with about six cameras pointing at them to record all the dialogue and reaction in real time. It was such a funny night. This series I think could be even funnier that the previous two and I thought they were great. I watched what will be the first episode. When this latest series is shown on the BBC in the Autumn. I had such a quality time laughing out loud with a group of very happy people. They record each scene all the way through twice. Then do any pick ups before they move on. There was a guest star on this one to. I do not want to give anything away but let us just say this person has previously worked with the writer. Talking of which it was great to see Ben Elton there. He was on hand and on mic to introduce each of the cast to us, give us some background details about the characters and the plot. He did also point out the main idea is based on historical facts. Well from the six or so facts only, that we know to be true about the exceptional play write. He also told some jokes and brilliant stories in true Ben Elton style. He still has the same energy, he had when he appeared hosting Saturday Night Live. When he introduced his old mate Harry Enfield, he did a Stavros impression. The cast seem to have a lot of fun making it. They were focused, professional and wanted to get the job done. But when the time allowed it, they were happy to mess about and add even more value to the recording. It was a fantastic evening. I cannot wait to see the whole series later this year. I have mentioned Logan Murray a few times before. I attended one of his brilliant Comedy Courses a few years ago. 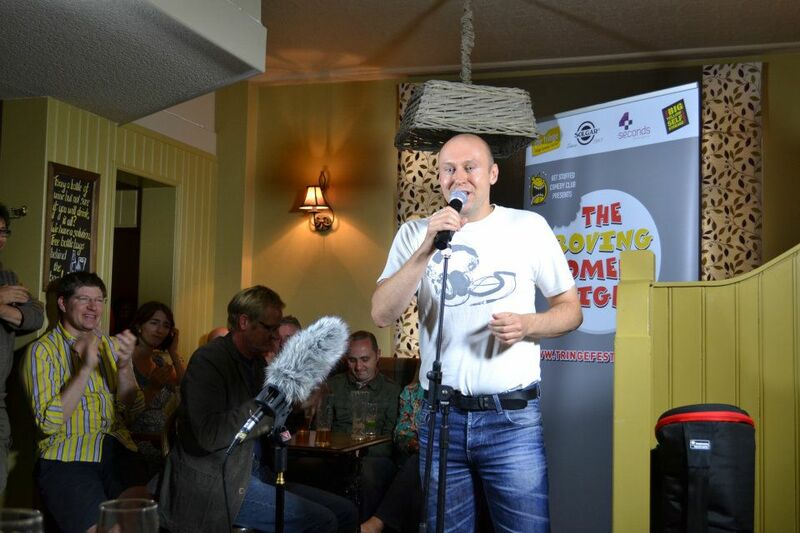 Which means I have something in common with Josh Widdicome, Greg Davies and Rhod Gilbert to mention but a few. The latter mentioned Logan during an interview with Simon Mayo on Radio 2. 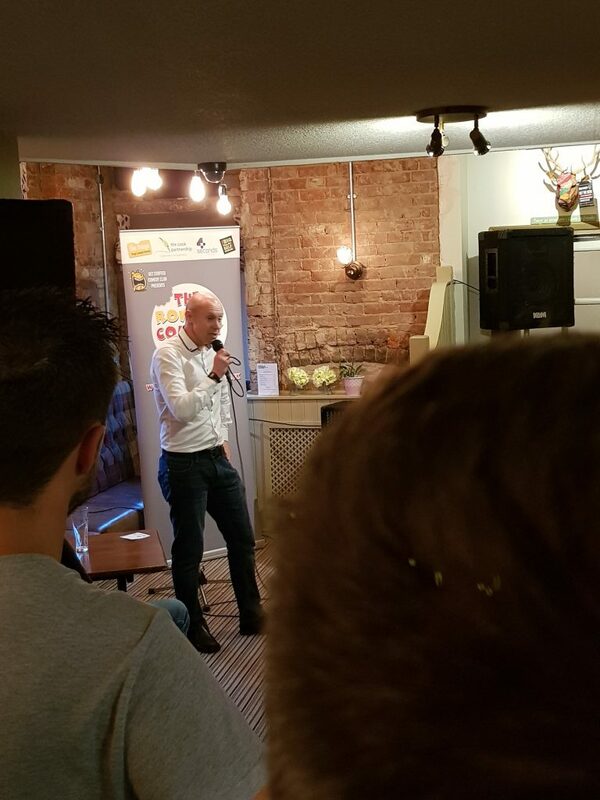 Which led to the comedy guru himself Mr Murray being on the next day talking a bit about his course and the basic set up of it. 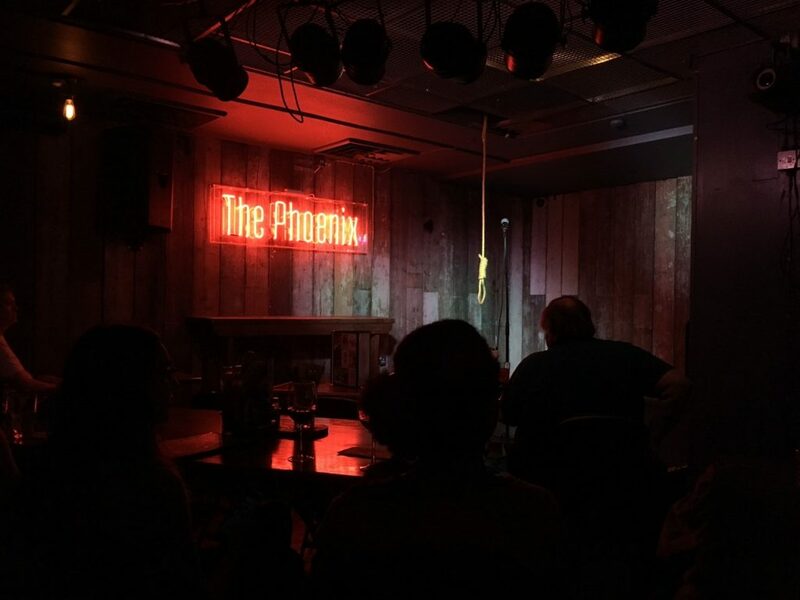 I spent another hilarious night in the Phoenix Pub in London at The Old Rope Comedy Night. Which is a new material evening for the cream of comic talent to come along and try out new jokes. It is the run by Tiff Stevenson along with her parents, who manage the door. Which instantly gives the place such a friendly and inclusive feel to it. Tiff was away in New York this week. So the night was hosted by the brilliant Lou Sanders. I have seen her a few times before. She is very funny. She did a wonderful job of moving the fun along while keeping us entertained between the acts. It is fair to say we learnt a lot about her during the evening, some of which I can never unlearn. It was another amazing line up. As it always is at this place. You get a rough list of comedians advertised before the gig but normally you get a few special guests just popping in unannounced. This time I saw Tom Ward who was ace. Jasper Cromwell- Jones, who I had not seen before but who is a character act based around a very posh adventurer. Which I feel we may see a lot more of. Geoff Norcott was on next, who you might know from the excellent Mash Report. He has got a pretty definite style and was brilliant to. Then the last act in the first half was Lloyd Langford, who I really like. He had been out for lunch with fellow comedian Matt Forde. Which was meant to be just food but turned in to a bit of a session. So by the time he got on stage. He was around eight pints to the good. Mind you he held it together fine and was still very funny. Although I think he might have been slightly relieved when it was all over. Top work all round during part one. Part two kicked off with the always great Tony Law. The man who headlined my first ever Stand Up gig. I got to spend the whole evening with him as we performed. He was once again great. He is another who has his own very distinctive style. Then it was Marlon Davis. It was great to see him back on stage after recovering from a very nasty car accident. Then there was a surprise appearance from Simon Brodkin. Possibly better known as his alto ego Lee Nelson. I actually had met Simon before because I played a Press Officer at a football club in the pilot of The Lee Nelson Well Good Show. But I was cut from the show, when it was eventually shown. That is show business kids! He was doing some new material as himself and was also very funny. Next up was the always fantastic Eleanor Tiernan. She was as ever brilliant. It is such and fun and funny night. Which is even more astounding when you remember that a lot of the gags are all brand new. The headline act for this visit was the excellent Hal Cruttenden. Who was on fantastic form. He was so good and assured. As you would expect from a man of his standing and experience. He rounded off the evening perfectly. If you are ever in London on a Monday night and not sure what to do. I would always say go to the Old Rope. You really cannot go wrong. My team Tottenham Hotspur are very lucky to still be in the FA Cup after nearly getting knocked out by a valiant effort from Newport County. We could really do without another game with the Champions League about to restart. But I will happily take that replay all day long to still be in the competition. I went to see the Manchester United match Wednesday. Which was a very pleasing night. I think scoring in the first eleven seconds did help us out a lot. But it was a great performance and a crucial win. Bring on the rest of the season! This week I have launched my brand new podcast. This will be available weekly. It contains lots of stories from my past, thoughts on everyday situations that I and everyone else find themselves in. 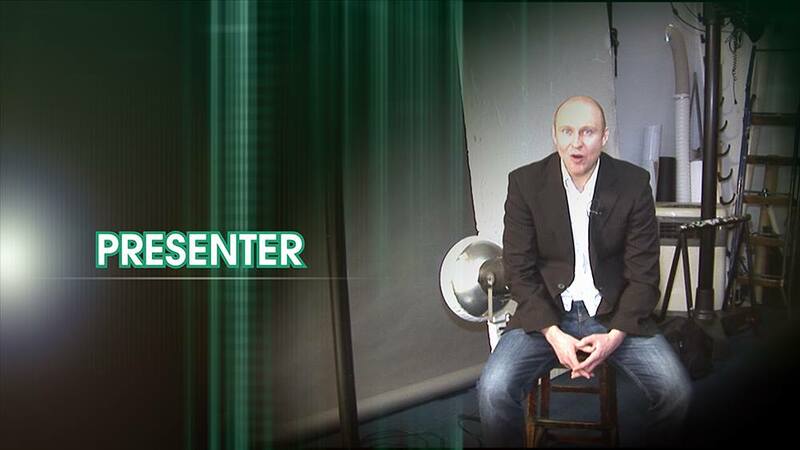 Plus a selection of interviews that I have done in the past with various interesting people.